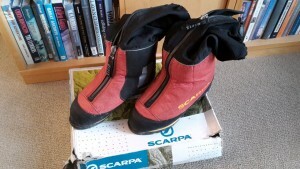 Complete the form below to be entered for the competition to win my Scarpa Phantom 8000m mountaineering boots that I wore on the summit of Manaslu. I value your privacy and will never spam you. You will receive my weekly blog post about mountains, and occasional info about new releases. And two free ebooks, the first immediately, and the second next month if you are still on my mailing list. You can unsubscribe any time.